Even though many in Africa continue to face serious financial adversity, their economic outlook is more positive than many others around the world, and they are hopeful about their children’s future. Overall, Africans, along with Asians and Latin Americans, tend to express more positive views about economic conditions than do Europeans and Middle Easterners. Similarly, optimism for the next generation is higher in Africa, Asia, and Latin America. Since our first international poll in 2001, the Pew Research Center has surveyed 26 African nations, exploring how average citizens across the continent feel about the important issues in their countries and their own lives, as well as examining their perspectives on religion, international affairs, and other topics. 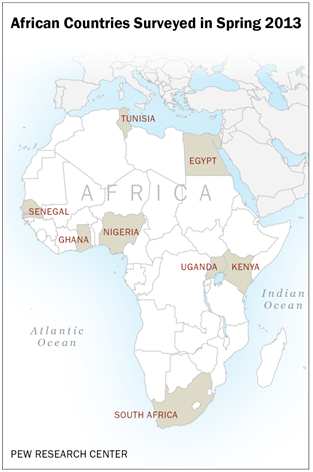 The spring 2013 39-nation survey by the Pew Research Center’s Global Attitudes Project included eight African countries: Egypt, Ghana, Kenya, Nigeria, Senegal, South Africa, Tunisia, and Uganda. Findings from the poll, which was conducted from March 2 to May 1, 2013, highlight the economic challenges facing these eight nations (see the Methodology Section of this report for more on how the poll was conducted). Many Africans continue to struggle financially, and in some countries, the share of the public who say they are sometimes unable to afford food is alarmingly high. And while inequality is considered a major problem across the globe, Africans are especially concerned about this issue. But, by many measures the economic outlook is far more grim in other parts of the world. In particular, most Middle Eastern and European publics surveyed offer overwhelmingly gloomy assessments of their economic situations – less than 5% describe economic conditions as good in Spain, Italy, and Greece – and in both regions there is relatively little optimism about the next generation’s economic prospects. In contrast, Africans, Asians, and Latin Americans tend to believe today’s children will be better off financially than their parents. 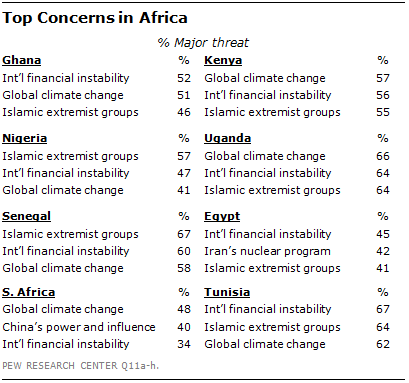 When thinking about international affairs, Africans tend to worry about the same problems as others around the world – specifically, international financial instability, global climate change, and Islamic extremist groups top their list of concerns. Meanwhile, two major players on the world stage, the United States and China, are widely popular in Africa, although America’s image remains somewhat stronger than China’s in the region. The big exceptions are in Egypt and Tunisia, which have a decidedly negative view of the U.S.
Below we highlight some of the key findings from the spring 2013 survey in Africa, and we compare our findings in Africa with those from other regions around the world. In the Appendix, we list several reports that include more extensive results for Africa and the other nations polled. This spring’s survey found varying assessments of national economic conditions in Africa. Among the eight African countries included in the study, South Africa and Kenya were the only two in which at least half said their economy was in good shape. Opinion was almost equally divided on this question in Senegal, while economic ratings were mostly negative in Uganda, Ghana, and Nigeria. Two countries that have experienced considerable political upheaval over the last two and a half years, Egypt and Tunisia, offered the most negative assessments. Even though many in these eight nations are dissatisfied with their economic situations, the mood in the Middle East and Europe is worse. Across the African nations surveyed, a median of 41% believe the economy is in good shape, compared with 27% in the Middle East and just 15% in Europe. Overall, Latin American countries are slightly more positive than the African nations included in the study – a median of 44% describe their economic situation positively across the seven Latin American countries polled. Asia offers the most positive economic evaluations – a median of 52% give their economy a favorable assessment. However, this relatively positive median percentage is driven by high ratings in only four of the eight nations polled in the region: China, Malaysia, the Philippines, and Australia. Views are largely negative in Indonesia, Japan, South Korea, and Pakistan. One striking finding from the survey is the pervasiveness of worries about inequality. In 31 of 39 nations, half or more say this is a very big problem in their country. The gap between rich and poor is an especially important challenge in Africa. In seven of eight African nations surveyed, at least seven-in-ten consider it a very big problem. Across these eight countries, a median of 76% hold this view, higher than any other region. However, inequality is a major concern in other regions as well. A median of 68% rate it a very big problem in Latin America, while 60% say the same in the Middle East. A median of 59% think inequality is a very big problem in Europe. Concerns are particularly strong in Greece, Italy, and Spain, three nations struggling with the ongoing effects of the euro crisis. The divide between rich and poor is less of a concern in Asia, although more than half describe it as a very big problem in Pakistan, South Korea, the Philippines, and China. Worries about inequality also are less prevalent in the United States and Canada. Still, nearly half in both countries think it is a very important issue. Levels of deprivation are relatively high in the African nations surveyed. Half or more report that there have been times in the last year when they have been unable to afford food for their families in Uganda, Nigeria, Ghana, South Africa, Kenya, and Senegal. Somewhat fewer say this in Egypt and Tunisia. Overall, there is a strong correlation between the percentage of people in a country who say they have not been able to afford food at some point in the last year and that country’s per capita gross domestic product, measured in terms of purchasing power parity, or PPP. 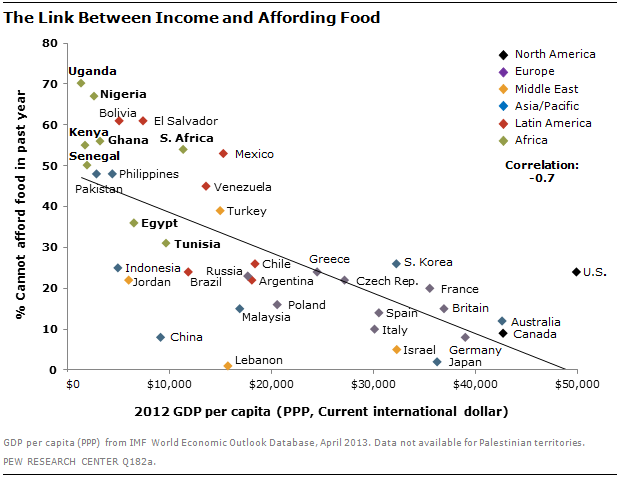 As one might expect, struggling to afford food is much less common in wealthier countries such as Canada, Australia, Japan, and Western European nations. The United States, however, has a higher percentage of people reporting difficulties buying food than its per capita income level would predict. Even though many in Africa struggle to afford life’s basic necessities, there is still considerable optimism about the future. A median of 50% believe children in their country today will be better off financially than their parents. Just 37% think children will be worse off. Optimism is especially widespread in Nigeria and Ghana, where nearly two-thirds say children will be better off. It is less common in Uganda and South Africa, where opinion is roughly divided between optimists and pessimists. Egypt is the least hopeful among the African nations studied – just 22% predict children will be better off than their parents. Some of the wealthiest nations in the world are among the least hopeful about prospects for the next generation. Pessimism is common throughout Western Europe, as well as in the U.S., Canada, Australia, and Japan. Doubts about the future are also common in the Middle East. Once again, the most positive results are found in Asia and Latin America. China registers the greatest optimism on the survey, with 82% saying they believe today’s children will be better off than their parents. When asked about potential international threats to their country, people in these eight African nations tend to emphasize international financial instability, global climate change, and Islamic extremist groups. They are generally less worried about the other potential threats included on the survey – Iran’s nuclear program, North Korea’s nuclear program, political instability in Pakistan, America’s power and influence, and China’s power and influence. However, there are some exceptions to this pattern. For instance, 40% of South Africans rate China’s power and influence a major threat, making it the second highest rated concern there. And the threat of a nuclear armed Iran is the second highest rated concern among Egyptians. African views about international dangers mirror those found in other regions. Across the 39 nations surveyed, the top concerns were the broad global threats of financial instability, climate change, and extremism. There was generally less concern about the threats posed by specific countries such as Iran, North Korea, Pakistan, China, and the United States. The world’s two leading powers, the U.S. and China, enjoy mostly positive images in Africa. Both nations receive higher favorability ratings in Africa than in the other regions included in the 2013 survey. Across the eight African nations, a median of 73% express a positive opinion of the U.S., while 65% hold this view about China. Globally, the U.S. generally gets higher marks than China on this question. However, while America’s image is positive in most of the African nations polled, this is not the case in the North African countries of Egypt and Tunisia. Only 16% of Egyptians and 42% of Tunisians have a favorable view of the U.S. Ratings for the U.S. are also relatively low in neighboring Turkey, Lebanon, Jordan, and the Palestinian territories. The Middle East is the one region where China receives higher marks than the U.S. (although with a median favorability of 40%, China’s ratings are not especially high in the region either). Solid majorities in seven of the eight African nations think the U.S. respects individual liberty. The exception is Egypt, where 45% hold this view. Meanwhile, more than half in only four African nations – Nigeria, Senegal, Tunisia, Kenya – say the Chinese government respects the personal freedoms of its people. Since 2008 and the onset of the financial crisis, global perceptions of American economic power have been in decline, while ratings of Chinese economic power have been on the rise. But in Africa, the U.S. is still considered the world’s top economy. Senegalese, Kenyans, Ugandans, Nigerians, Ghanaians, and South Africans are significantly more likely to name the U.S., rather than China, as the world’s leading economic power. Egyptians and Tunisians, however, are more closely divided on this question. Africans clearly want a good relationship with the U.S., although positive relations with Beijing are also a priority. When asked whether it is more important for their country to have strong ties with the U.S. or China, the balance of opinion leans toward the U.S. in Uganda, Senegal, and Ghana, while Kenyans and South Africans are more divided. 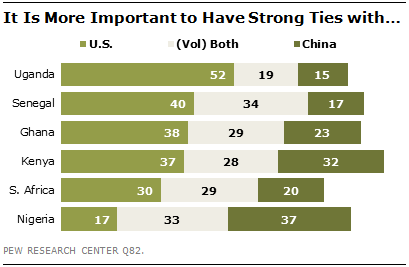 In Nigeria, 37% say a strong relationship with China is more important, compared with just 17% who say this about the U.S. (the question was not asked in Egypt or Tunisia). However, in all of these countries a sizeable minority volunteer that having strong ties with both is equally important, reflecting the view that both of these major powers can play a positive role in the continent’s future.